It's believed that silica supplementation may be a key factor in helping us maintain a healthier, more youthful, and pain-free body— and in reducing the body's natural recovery time. Silica and the bones and joints: Calcium and Vitamin D alone are not sufficient for bone growth, density, strength, and flexibility. Silica, along with other trace minerals found in this formula, is needed to strengthen bones and increase collagen production. Cellfood Essential Silica Formula contains easy-to-absorb silica plus all the needed additional trace minerals. Silica and the skin, hair, nails, teeth + gums: Studies show that without adequate silica, the body cannot maintain optimum skin elasticity, strong hair, nails, teeth and gums. Silica and the heart: Studies confirm that with age, silica disappears from the aorta, the hearts key blood vessel, thus weakening its critical connective tissue, and resulting in a greater cardiac risk. Silica and the brain: Silica levels decrease with aging and therefore may be needed in larger amounts by the elderly. Studies show that silica counteracts the effects of aluminum on the body and therefore may be important in supporting neurological health. Support for neurological health by helping to remove aluminum from the body. Studies show silica appears to decrease risk of Alzheimers by reducing the oral absorption of aluminum or increases the excretion of aluminum. Silica works in synergy with boron, calcium, magnesium, potassium, and ascorbic acid. Cellfood Silica contains all of these elements which support bones, arteries, connective tissue, healthy hair, skin, and nails. Bone can not re-mineralize and repair itself if enough Silica is not present. When we age, our Silica levels decrease and we begin to exhibit other signs of aging such as dry skin, lack of energy and slower healing. It is believed that Silica supplementation may be a part of this solution to aging. Maintaining a regular supply of Silica to our bodies as we age should help us to maintain a more youthful state and to live our lives in minimal pain. Silica is a natural compound made up of silicon and oxygen. All connective tissue cells in the body, nails, hair and skin contain Silica. Silica molecules enhance the body's ability to increase water absorption of essential proteins, acting as a binding agent. By binding existing calcium, protein and water molecules together, they help strengthen and revitalized skin, hair and nails. Silica is of great importance in the regeneration of tissue as is calcium. Diseases of the respiratory tract (lungs, bronchial tubes and pleura) and the glandular system likewise depend upon silica for help. Our bodies need boron, magnesium, manganese, potassium, iron and phosphorous in order to assimilate the silica in our system. Cellfood Silica contains all these elements, and all from natural plant sources. 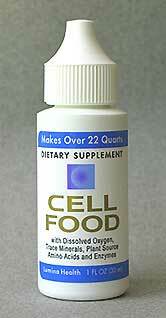 Cellfood Silica is an extremely easy to absorb and easy to drink liquid mineral supplement. That is what sets it apart from other Silica mineral supplements. Because it is liquid and has a very small molecular size, it is one of the easiest-to-absorb products on the market. Most silica mineral supplements on the market today are in tablet form and are not as easily absorbed by the body. It's important to understand that years ago, Silica was found naturally in foods - primarily in grains. Now that most foods are processed, most of the natural Silica has been refined out. Contains pure Silica and Cellfood (a proprietary blend of 78 minerals, 34 enzymes, 17 amino acids, electrolytes and dissolved oxygen). We do not ship Cellfood Products to some countries, as they have representation for Cellfood. Please check for your country before ordering. We can however send other products, such as Gematria, Safe Tan and Willard Water.